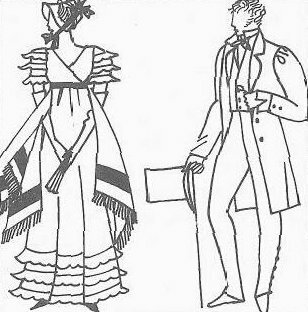 style of dress from the Napoleonic era (1804-15). Spread quickly across the whole of Europe. Popular for its plain, sober, classic lines and small necklines. Fabrics of too light a weight were replaced with warmer velvets, brocades and plain cloths. Womenswear had a shirt-like cut and reached to below the ankles; it had more divisions than earlier, the trail disappeared and the waist was lowered somewhat. The colours and whites of garments were retained. It was typically accessorized with a cashmere shawl and jewels. Menswear, too, was simplified and made more sober. Trousers were made longer, though their shape underwent only minor modifications; they were initially slipped into high boots, later made to reach the ankle. With the trousers was worn an evening jacket which was short in the waist and had a high, folded collar and wide lapels. A suit was equipped with a waistcoat. Over the jacket a short coat and overcoat were worn.